My high school crush and I experienced a unique getaway on a cruise specifically, Manila Bay Cruise by Sun Cruises (nice huh?). What you just need to do is schedule and call this number: 09175132625 or go to their reservation offices. After scheduling your cruise, buy the tickets at SM ticket outlets. Each ticket costs 550 with set meal already and acoustic band on board. In fairness, the food was delicious, the waiters were professional as well and their singer could really entertain you. Again, prior booking is really required to have you listed on their schedule. When I went shopping at the SM MOA, I grabbed this chance to ask the customer service where I could buy the tickets. Anyway, proceed to the movie outlet and ask personnel that you want to buy tickets. They will ask you if you've already called for prior booking – just give them your reference number and you are good to purchase tickets. So much for the flowers, I also had unpleasant experiences for the cancellations of our cruise trip due to the bad weather. Mind you, they are so sensitive about the weather because their priority is safety first. You can ask for a refund or reschedule your trip. No problem with that since they're the ones cancelling your trip – the reservation staff will call you, informing about the cancellation and or rescheduling your trip. Just in case you’re undecided with your preferred date yet, tell the staff to make your schedule open and call them later or next time to finalize your schedule. By the way, our trip was two times cancelled. Furthermore, Fatima and I were already at the Sun Cruises Terminal and arrived there an hour before the on boarding time (required time is 30 minutes prior to on boarding). We had fun with the photo shoots and conversations not until the Captain announced that he couldn’t push through the trip because of uncertain and unpredictable weather as the waves were starting to rogue. But they said we could just dine in and relax on the cruise while listening to their acoustic. There, it left us no other choice but to take it, considering my friend filed an early out from her job just to be there. So we just enjoyed the ambiance, the sunset delighted us, while waiting for our food to be served and their acoustic entertained us. It was romantic, still. The little swinging of cruise made us to believe like we were sailing. 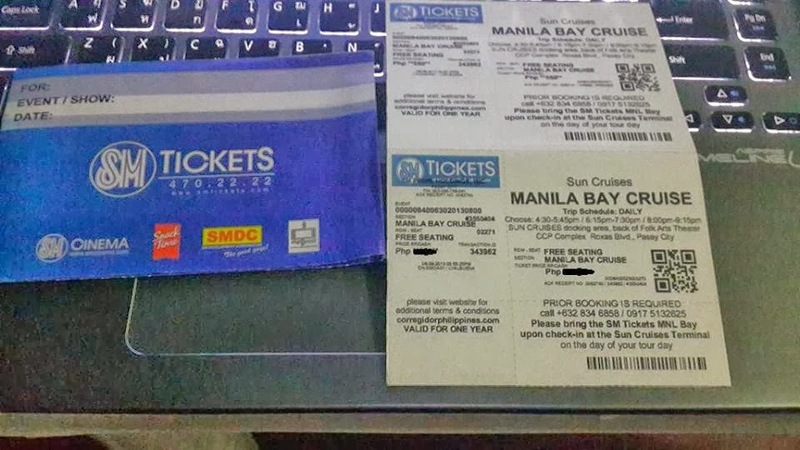 My Manila Bay Cruise was a wondrous experience, in deed. To all romantic lovers out there, I recommend you to try a cruise date in the summer because the weather is perfect to sail, you can’t feel any waves and you’ll be amazed to witness tranquility of the sea, the sunset and the ambiance for an hour. Overall, it was unforgettable and one of a kind experience. The set meal was sumptuous and we experienced a tropical evening, giving us a more exhilarating night. If you plan to get away from Metro Manila’s hustle and bustle of the city, try this cruise for an hour relaxation in a romantic atmosphere. And if you’re coming from provinces who also want to indulge an exciting getaway and witness the city lights of the Mall of Asia and get attracted of a night time spectacle let the cruise take you there and enjoy. If you happened to watch Be Careful With My Heart, it’s Sir Chief and Maya had their dinner date and, Richard (Ser Chief) proposed to Maya. I hope you find this article helpful, please share this to your family and friends!